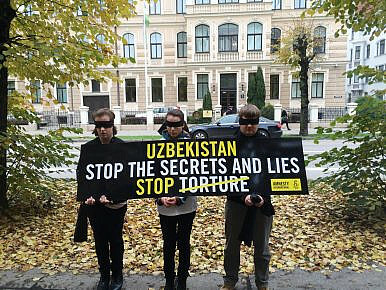 Amnesty International Latvia activists call for an end to torture and other ill-treatment by security forces and prison personnel in Uzbekistan. On Tuesday the 21st of October almost 200,000 signatures were delivered to Uzbek embassies across Europe. Anna Neistat, who visited Uzbekistan in the aftermath of the 2005 Andijan massacre, reflects on Islam Karimov’s death. One of the many grim records of Islam Karimov’s 27 year rule of Uzbekistan is having the world’s longest imprisoned journalist, Muhammad Bekzhanov. He has spent more than half of Karimov’s reign in jail, just for daring to criticize the government. Bekzhanov was the editor-in-chief of an opposition newspaper when he was sentenced to 15 years in prison in 1999, after being tortured by members of the security forces into confessing to “anti-state” offences. Mistreatment in prison has left him deaf in one ear and suffering from tuberculosis. Amnesty International campaigned for his release for years, its supporters sending hundreds of thousands of messages on his behalf. Yet the authorities would not be moved. As in so many other cases, Uzbekistan remained deaf to criticism of its human rights record. In 2012, instead of freeing him, the authorities actually extended his sentence. Throughout Islam Karimov’s years as president, Amnesty International documented reports of torture, extrajudicial killing, and a culture of impunity. So stifling was the regime’s repression that the country’s fortunes are unlikely to be revived anytime soon. Karimov never shied away from torture and massacres to crush his opponents, as I saw first-hand in 2005. That year, Karimov’s security forces shot dead hundreds of protesters in the main square in the eastern city of Andijan. Weeks later, I traveled undercover into Uzbekistan to interview those who had survived the slaughter, as well as the relatives of those who had not. They spoke in hushed tones, behind closed doors, refusing to be quoted by name. Most of the bullet-holes in the square had by then been patched up, but the people I met were terrified of what might happen next. For while the Andijan massacre may have been the most notorious of Karimov’s crimes reported abroad, it was the ensuing cover-up and crackdown that tapped into the everyday dread felt by Uzbekistan’s citizens. After the massacre, the authorities tried to impose their own version of events, insisting that the protest had been orchestrated by armed extremists. In an effort to silence anyone who could contradict the official account, thousands of people were imprisoned. The authorities also pursued some 500 Uzbekistani citizens who had fled to neighboring Kyrgyzstan, each one of them a potentially hostile witness. Most of these refugees eventually resettled in other countries, but some felt they had no choice but to return because their relatives had been imprisoned in Uzbekistan. Despite assurances from the government, they too ended up in prison. These actions were in keeping with measures Amnesty International documented throughout Karimov’s rule, during which the authorities consistently disregarded the rule of law and human rights. Arbitrary detention, torture, and other ill-treatment have become defining features of the criminal justice system. These are the tools by which the Uzbek authorities have dealt with dissent and maintained their grip on power. Just this April, an Amnesty International report showed how judges routinely hand down convictions based on confessions obtained under torture. Meanwhile, defendants’ complaints of torture or other ill-treatment are ignored or dismissed. Uzbekistani authorities have also routinely invoked national security interests and the need to combat “anti-state activity” as justification for repressive measures against scores of people whom they wish to silence. This has included political opponents, critics of the government, journalists like Muhammad Bekzhanov, Muslims who worship in mosques outside state control, and actual or suspected members of outlawed Islamist groups and parties. Despite some international condemnation of Islam Karimov’s repression, Uzbekistan has successfully cultivated alliances with the major powers. Terrifyingly, even fleeing the country did not bring safety to the victims of brutal state repression. Russian authorities have repeatedly violated their international obligations by extraditing Uzbekistani refugees, asylum seekers, and migrants wanted back home on the grounds of “national security.” Sometimes they looked the other way as Uzbekistani security forces abducted people. Many of those forcibly returned have subsequently been tortured by law enforcement officers. Meanwhile, Western governments have often turned a blind eye to Uzbekistan’s horrendous human rights violations in exchange for logistical support for the U.S.-led coalition in Afghanistan. The European Union imposed sanctions on Uzbekistan following the Andijan massacre, but these were later lifted with very little to show for it. Will anyone will ever be held accountable for the abuses committed during Karimov’s rule? What does it say about the international community that a leader can oversee grievous abuses for so long without a shred of accountability or effective outside pressure? Karimov’s death does at least provide a chance for Uzbekistan’s allies to reconsider the terms of their relationship with one of the world’s most repressive states, and end their shameful silence about human rights abuses. Anna Neistat is Senior Director for Research at Amnesty International.